DAVAO CITY, Philippines — What is an NPA? For Sister Stella Matutina of the Order of Saint Benedict, being an environmentalist certainly does not make her one. The genteel 43-year old Catholic nun took time to speak against the military who, she and other environmentalist groups claimed, marked her as a member of the communist New People’s Army. 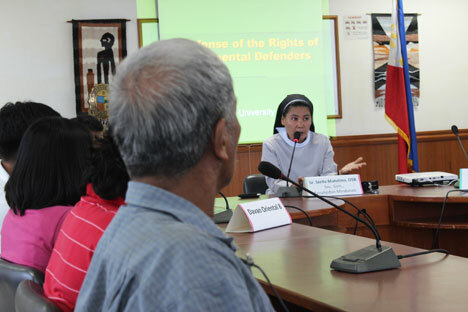 “I don’t have weapons and they know that,” Matutina said in a press conference on Monday at the Ateneo de Davao University. Matutina is a spokesperson of Panalipdan Mindanao, a group known for its resistance to destructive large-scale mining operations and militarization that accompany these projects. 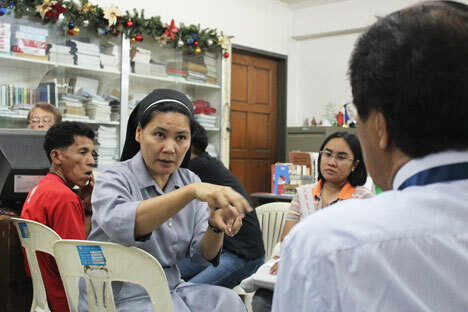 Before speaking to Davao media, Matutina brought the issue of red-tagging to the United Nations Human Rights council meeting in Geneva, Switzerland last March where, representing Panalipdan and the active nuns group Sisters Association in Mindanao, she was a delegate to the Philippine Universal Periodic Review Watch. For this, Matutina lodged a formal complaint against the 28th and 67th Infantry Battalions of the Philippine Army before the Commission of Human Rights (CHR) May 8. CHR regional chief Roberto Sipaco said he is readying a subpoena for the respondents. Matutina had basis to criticize the AFP for including her in their witch hunt. Three years ago, she and her group were detained by the military for almost eight hours at a far flung village hall in Cateel town, Davao Oriental where they were holding an environment seminar. The AFP singled out the nun for participating in what they accused as an NPA activity. So she claims she is a nun. But she looks and acts like an NPA. Treat as a NPA and that is it.